Santa isn't the only one who's making a list and checking it twice. Data center managers everywhere are assessing the pros and cons of data center infrastructure management (DCIM) software, and many are finding DCIM to be more "nice" than "naughty" – especially now that REST APIs have dramatically improved integration capabilities. Through 2020, the global DCIM market is forecast to grow at a compound annual rate of nearly 15 percent. Capacity planning ensures that resources for IT (servers, switches) and facilities (CRACs, power, space) are capable of supporting data center loads during peak and off-peak hours. Functionally, capacity planning calculates present load capacity, but also forecasts future capacity requirements based on current and past resource utilization. "Capacity planning is the foundation of flexible IT infrastructure." In the short term, this facilitates responsive data center infrastructure in the face of day-to-day load fluctuations, which you might recognize as "elasticity." Over time as an organization grows, it uses capacity planning to prompt infrastructure adjustments in order to accommodate gradually increasing loads, which is the definition of "scalability." In this way, capacity planning is the foundation of flexible IT infrastructure as we know it. Asset management is concerned with the live status of cabinets, servers, switches, power distribution units (PDUs), CRACs, backup power equipment and other critical resources that are loaded into the data center. Specifically, asset management creates a system by which all equipment added or removed to a data center is registered, tracked and updated as its status changes over time. This leads to the creation of a real-time, virtual inventory of all resources. Change management, which is the tracking of updates to this inventory over time, is another DCIM feature that stems from asset management. Together, they improve resource visibility in the data center, thereby fostering more accurate capacity planning and creating opportunities to optimize footprint. 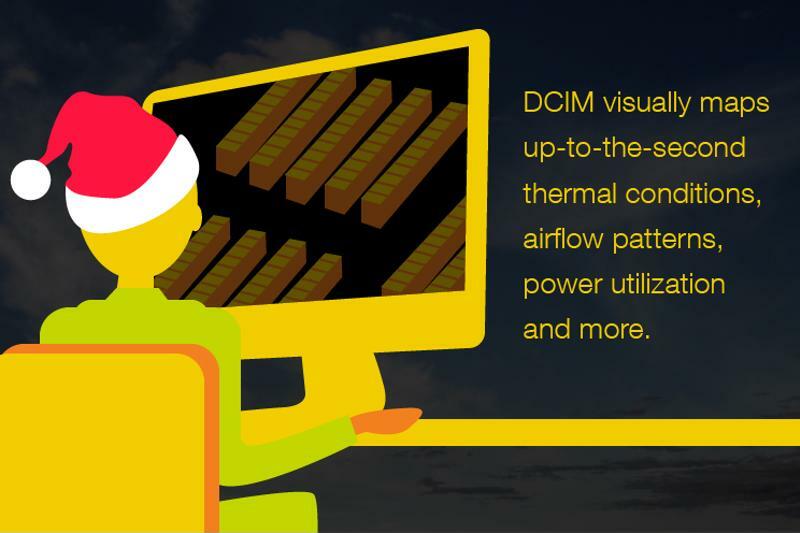 DCIM is your window into the data center. When integrated with robust data center monitoring systems, DCIM can achieve an extraordinary level of the omniscience in the data center. But more importantly, it can depict the conditions of your facility in a series of polished, digital visualizations. For example, facility floor maps can be digitally reconstructed to show where assets are located and the operational status of each. Power distribution, airflow, temperature and other facility conditions can be represented in different heat maps. All of this detail is visible via a central management console that would give Kris Kringle's powers of perception a run for their money. Data centers are as crucial to business operations as any office space or suite of productivity tools. But properly conveying the operational dynamics of a facility in reports is complicated to say the least, and failures may result in miscommunications between business stakeholders and the facilities teams on the ground. DCIM addresses this problem by making it easier to represent data in a meaningful way for an executive audience. Key metrics such as power usage effectiveness (PUE) can be contextualized with other important factors, such as amount of useful work per watt. Equally important, this data can integrate with enterprise resource planning (ERP). Consequently, business decisions will accurately reflect the realities of data center operations so that the Santas of industry are always on the same page as the elves.